ANNVILLE, PA – Host Lebanon Valley scored 26 points in a big second quarter offensive explosion on way to a 46-0 Middle Atlantic Conference victory over Wilkes University Saturday afternoon at Arnold Field. With the defeat Wilkes slips to 2-5 overall and stands 2-4 in MAC games. Lebanon Valley, winners of two-straight, moves to 2-5 overall and 2-4 in league play. The Dutchmen had little trouble moving the ball both on the ground and through the air throughout the game totaling a season-high 547 total yards of offense including 261 yards and five touchdowns rushing. Brandon Irving began his big afternoon on the ground with a 10-yard touchdown run to put LVC up 7-0 just four minutes into the game on the Dutchmen’s first drive. LVC then used the 26-point outburst in the second quarter including two scores on the ground and two more through the air to take a 33-0 lead into the break. Irving’s third touchdown of the day, this time a 39-yard dash to the end zone, put LVC up 40-0 early in the third quarter and sealed the MAC win for the Dutchmen. The Colonels sputtered on offense throughout the game punting seven times and turning the ball over three more times (two interceptions and one fumble). Its most promising drive came late in the fourth quarter when Marcellus Hayes’ pass into the end zone was dropped by Glenn Weist to turn the ball over on downs. Wilkes didn’t see a single rusher over 20 yards in the game as LVC’s run defense stood tall throughout allowing only 53 total Wilkes yards on the ground. Ryan Dailey finished 14-for-34 passing for 175 yards for Wilkes. Hayes entered in relief going 3-for-11 for 28 yards. Tim Bousson caught a season-high five passes for 95 yards to lead the Colonel receivers. 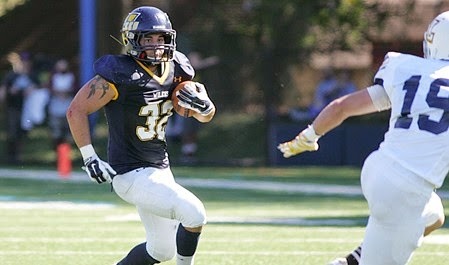 Irving led LVC with 148 yards and three scores on the ground. Quarterback Brian Murphy was efficient finishing 11-for-14 for 286 yards and two touchdowns. Tyler George led all Dutchmen receivers with six catches for 166 yards and a score. Isaiah Robinson led the Wilkes defense with 12 tackles. Tanner Stengel also added 12 stops and one sack. The Colonels return home after a four-week hiatus to host Albright College (3-4, 2-4 MAC) at 1:00 p.m.at Schmidt Stadium.